More natural skin care products…! I started this series a while back thinking that it was really hard to find decent natural products in the UAE (particularly here in Abu Dhabi), but since I really started looking, it seems that everywhere I turn now there’s another natural product which is great! 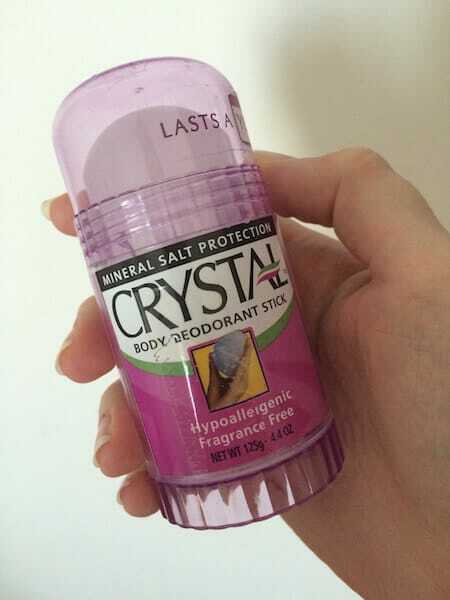 So here’s what I think of the one’s I’ve been trying lately…I’ve always been a bit suspicious of natural deodorants, never convinced that they would really work, so it took me a while to get into the way of trying this crystal stick out. At first I couldn’t quite get the hang of it – you have to dampen it before applying, so that in itself seemed to add a level of complication that traditional deodorants don’t have! But, I persevered and found that a quick dab under the tap worked well, and the deodorant slid on. I’ve got to say I still felt a bit sceptical – it didn’t really feel like anything had happened – and there were certainly none of those annoying marks on my clothes that the usual chemical laden deodorants leave, but that in itself was a big win for me. I guess my final verdict on this is that I don’t know how it works, but I can assure you that it does. It’s an amazing little piece of deo-stealthiness, a silent assassin to sweaty smells. It’s really very impressive. And whilst I have read that there may still be health concerns about these mineral sticks since they usually contain Aluminium, and some people link this to Alzheimers disease (though the Alzheimers Society says there isn’t any real evidence to say that this is true), I reckon that this stick is a darn sight safer and more natural than the majority of the deodorants on the supermarket shelves, so that for me is a big improvement and a good place to start. Natural Deo sticks like this one are available here in the Organic Foods and Cafe. Dr. Lipp is another one of these celebrity faves, or so I’m told… but to be quite honest, I’d never heard of it until I saw it was available at Glamour Salon. I love a good lip balm, me, and I especially like thick ones that don’t slip off and last well. Dr. Lipp is certainly that – very, very thick and stiff to apply since it’s made from pure medical grade Lanolin and doesn’t budge a bit. Even as a lover of thick balms I felt it was a little on the thick side but works quite well at night time for ultra moisturisation. Or, you’ve got chapped or sore lips, this is perfect to keep them protected. 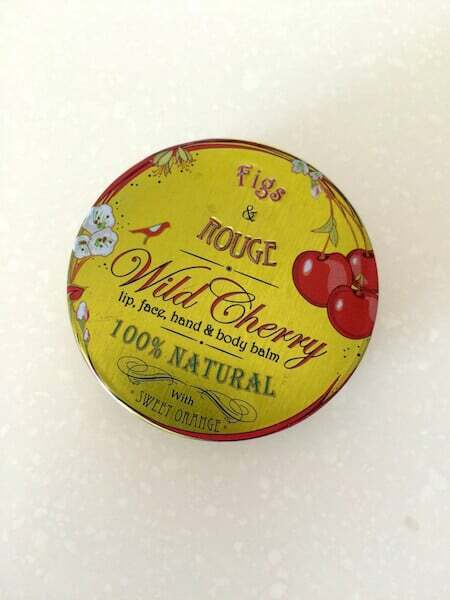 Another lippy – Figs and Rouge Wild Cherry, and I think this one has to win for me. I was initially attracted by the super cute packaging, and then on realising it was also 100% natural I just had to try it. I can’t say enough good things about this one – it’s thick, but not too thick, makes my lips feel moisturised and it doesn’t slip off after eating or drinking which leaves my lips feeling super soft for ages. I absolutely love this product and you can even use it as a body balm too or for dry spots and cuticles etc – the only problem being that every time I have gone back to buy some more, it’s been sold out 🙁 You can buy this at Boots here in the UAE. Soooooo, the Vitamin E Skin Oil is just fabulous… it’s great for really dry skin – the only thing is that the bottle is just 60ml so whilst it’s great for small areas it’s not really suitable for all over body use. Although that said, a little really does go a long way and it is a lovely product. I like to use it on my face at night time – my skin is amazing when I wake up in the morning after doing this! So dewy and glowy! I also really enjoy using the Anti-Wrinkle Vitamin A Glycolic Scrub. I’ll admit it sounds a bit scary, but it’s really rather fabulous. Initially, the words ‘glycolic scrub’ conjure up images of cosmeceutical type procedures (those places and treatments scare me a little) and it’s hard to believe that it’s natural – but it really is free of all nasties – as all their products are, and contains some good gritty but gentle exfoliating bits leaving my skin feeling uh-mazingly smooth and silky! This one’s a keeper for sure. Last but not least – when I saw there was a natural sunscreen I was definitely dubious about it. The very thing that offers the skin protection is usually the thing that is full of nasties, but if you look this product up on the EWG Skin Deep database you’ll see that it gets the all clear – hurrah! The product feels quite thick in your fingers, but once you get used to it and don’t use too much it goes on easily and doesn’t feel heavy on the skin at all. A clear winner in my book – finally, a natural product that protects me from the sun! It even comes in a body lotion version too for all over everyday protection (and when you’re as fair as I am, this is a good thing for just walking down the street!). 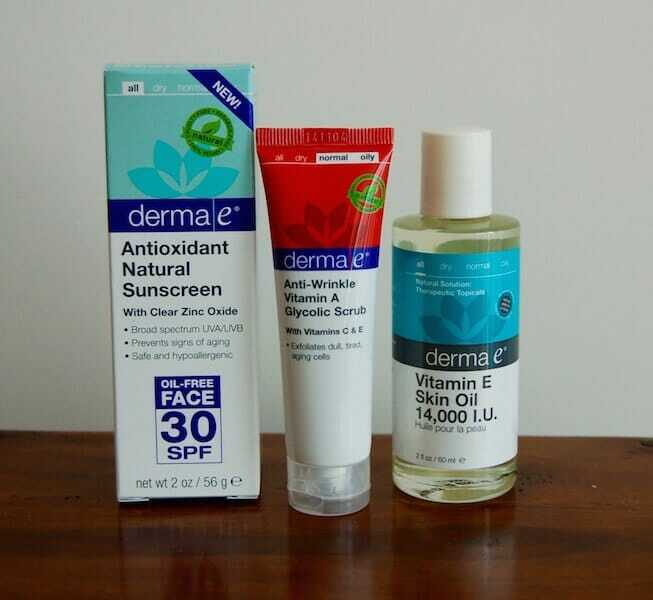 You can find Derma E products at Boots, United Group of Pharmacies and Bin Sina outlets including at Yas Mall, Abu Dhabi peeps! Next up is Green People… I’ve become a bit of a fan of these guys I must say since every product of theirs I’ve tried so far has been great. The shampoo and conditioner for coloured/dry hair is no different – lathers up nicely and leaves my hair feeling clean and soft afterwards. There’s also no noticeable deterioration in my hair colour so that’s another win. 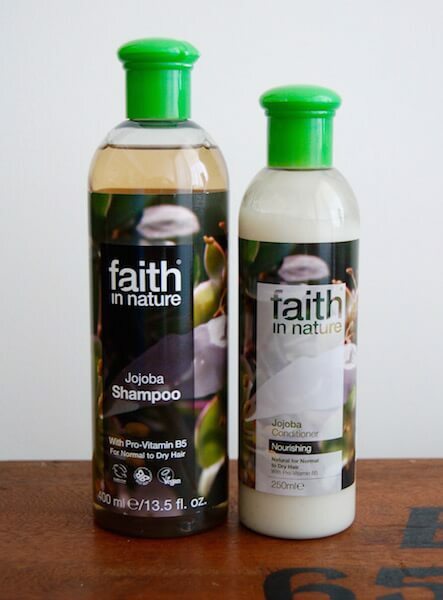 I always like to have more than one shampoo and conditioner on the go at the same time – it’s nice to mix it up a bit and to avoid build up from my hair getting too used to one product so I’ve also been using Faith in Nature Jojoba shampoo and conditioner. This is another one I really like – lathers up well, cleans easily and leaves my hair soft and smooth afterwards. It also has a lovely smell about it. 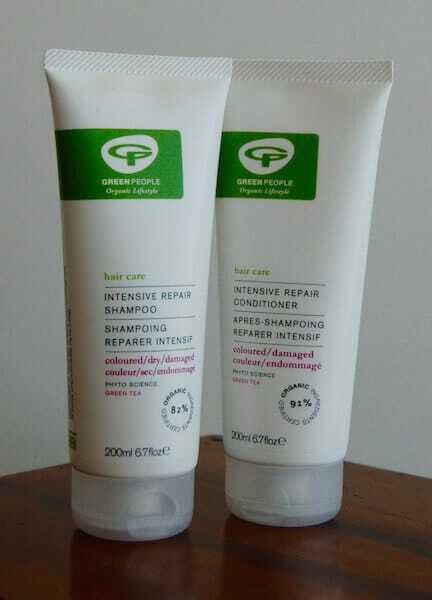 Both the Faith in Nature and the Green People shampoos are available at Treehugger, through their online store.